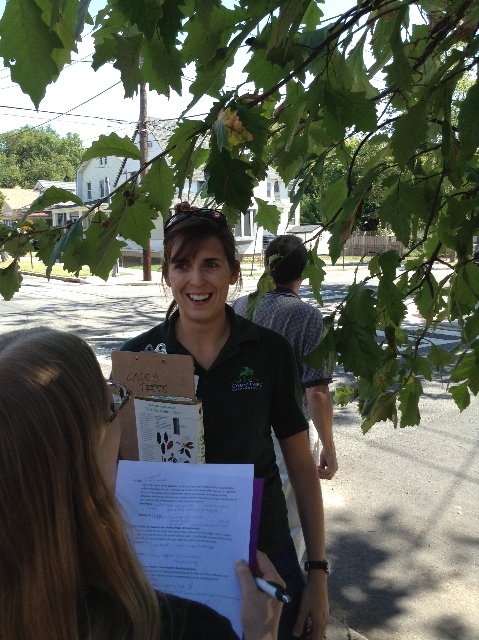 Stephanie Juchs, community education coordinator for Casey Trees, on Sept. 14, led an advanced training session of tree identification at the organization’s Washington, D.C. location. – The Paw Paw Tree (Asimina triloba) produces the largest native fruit in North America. – For every 1 inch of caliper a tree needs about 1 year to become established: A 6-inch caliper tree, then, needs six years to make itself at home. The implications of this are enormous for the homeowner. Who wants to water a tree week in and week out for six lo-o-o-o-ng years? Plant a whip and it settles in far quicker, freeing up a homeowner to pursue more interesting activities. That’s a big advantage to planting smaller trees — much like the ones the county is offering for the tree giveaway. What’s a happy medium? A 2-inch caliper tree.